I had to chuckle the other day when someone made a comment that the NFL ís 16- game season was about to kick off for the year. My husband on the other hand fell to the floor in a fit of hysterics. Since when has it been just a 16 - week season? And since when did it begin the first week in September? He was quick to remind me that by the time the season starts I will have already been on the road twice, not including training camp. And since I don't cover the Texans, I can already plan on adding a couple of weeks to the usual sixteen. Unless a complete fiasco occurs, the Buccaneers are usually good for at least two post season games. 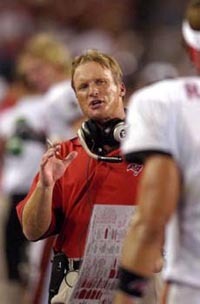 New Bucs coach Jon Gruden. Covering the Tampa Bay Buccaneers training camp has always been a breeze. The team was in camp for only two weeks and it was a 5-minute drive to the facility - if you were unlucky enough to get a red light. This year with a new sheriff in town, not only was camp two weeks longer but it was also moved two hours away to Orlando. I know, that's a lot closer than most teams practice so I really shouldn't be complaining. I had the benefit of being able driving home if I wanted which is more than I can say for my friend Jonathan Newton at the Washington Post. Can things be much worse than sharing in a dorm room with three reporters for two weeks? TV only if you bring one. "Welcome to the big time," he says. Thankfully the team took a mid camp trip to Japan to break it up. You're right, what could be more perfect than training camp at Disney where everyone is forced to greet you with a smile! Besides being able to drive home when I wanted, my newspaper was also generous enough to split the summer duty between two photographers. And then, wise enough to realize after the preseason games started, photographing practice was really nothing more than deathwatch. At that point most newspapers only publish file photos of the players in game uniforms anyhow. We got lucky this year in that no one was seriously injured during those final two weeks of practice, so I think we'll be able to get away with the arrangement next year too. Ha, I tell my husband. He got off easy with my one week tour of duty --- I know photographers that have been on the road for three weeks before the first PRE season game even rolled around. While the season is still young (or not even started), it seems like not much has changed from last year. Security at each stadium is similar just enough to lull you into a sense of comfort, and then different just enough to aggravate you. I've been told (and experienced it once already this year) that some stadiums require you to turn on your computers before you can pass through security. If your startup files are loaded with as many programs and other junk as mine, that can take you awhile. Unfortunately, the time I was asked I was carrying two computers so I held up the line for a bit. And you know those television colleagues of ours- they can get testy quick! (Especially when there's more than hot dogs at stake.) From here on out you better believe I'll have the computers in sleep mode just on case. As for traveling, I thought for sure this year would be a breeze. Last year was a bit chaotic, but not really as hard as I thought. With most of our away games scheduled for 1:00 p.m. starts, we often booked flights out that night. There were even times last year I was able to do the Delta Dash and catch a flight after spending less than an hour at the airport. I'll admit the thought of missing flights fried my nerves though, so I don't think I'll be doing that again this year. I got lucky with our first road game this pre season. It was only a 4-hour drive to Jacksonville so why not. To fly, you figure you would have spent as much time- if not more- waiting in lines for boarding passes, security, and rental cars. Now the second trip was different. Since traveling was so easy last year, I decided to bring along my two-year old daughter on this trip. We were playing in Houston so I tacked on a few comp days and made it a vacation to visit the grandparents. First, I wore the wrong shoes. Only travel in tennis shoes! That set off the beeper which sent me to the line to be wanded. I still had to coax my daughter through the metal detector (for some reason we couldn't go together.) That was easy, but then I made the MISTAKE of grabbing her hand of all things. Now the baby has to wanded they told me. After all, I touched her. And you wouldn't believe the things people do to their babies the guard told me. They strap bombs to them all the time, she said. Where? In the movies? And how could I have passed off something so quickly? Good thing she thought it was more of a game than anything. But I wasn't even able to hold her or help her raise her hands with out creating a security disturbance. By the time we got done being wanded it was time to search my carry-on. And search it they did. So much for my neat packing fitting everything into a specific space so that I could get as much as possible to fit. With lens hoods that constantly need fixing, I always travel with a set of mini screwdrivers. Surprisingly, I never had a problem with them last year. Then again my bag had never been gone through as thoroughly before. At least the guard was nice enough to go and check with a supervisor after finding them before outlawing them out right. So he returns a minute later with one in his hand. I noticed it's a flathead, and I only use the phillips so I'm ready to let him confiscate it. "You can bring this one with you," he tells me. It was like he randomly picked one. It wasn't the smallest (which I admit looked very sharp), but it wasn't the largest size either. It made no sense to me. They offered to let me go back to the main terminal to put it in my luggage (which was probably already on the plane) or I could mail it back to myself at the airport post office. Either way I would have to pass through security again and start the process all over. That was a "Groundhog Day" scene I was not willing to repeat. I suppose I wouldn't have been bothered by it all if I didn't actually cover news during the off season. I had been to the airport only a month or two before to cover the transition from private security firms to the new improved federalized guards. I know that at my local airport the previous security personnel were grandfathered in --- which meant they still did not need to have a high school diploma. I hope that's not an indication of how things will shake out for the whole season. If so, it's going to be a LONG season. I'll let you know how it goes. After all it hasn't even started yet.